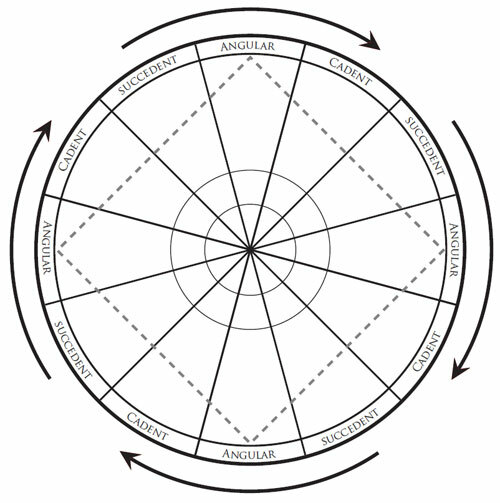 Cadent is a term used to refer to the 3rd, 6th, 9th and 12th houses in an astrological chart. These four houses are referred to as the “cadent houses”, and planets in those houses are said to be “cadent”. The term “cadent” is derived from the Latin word cado, which means “to fall down” or “to decline”. The Latin term was originally derived from the Greek word apoklima (ἀπόκλιμα), which means “slope” or “decline”. 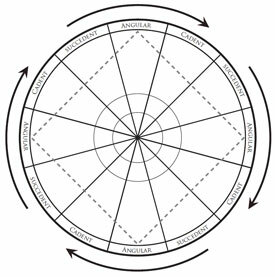 The cadent houses are ones in which the planets are said to decline because all four of them precede the angular houses in the diurnal rotation, and thus they are declining or falling away from the angles. The angular houses are thought to be the ones in which the planets are goaded into action, and thus the planets are more active and efficacious there, whereas the succeedent houses are rising up towards the angles, and thus the planets are becoming more active and powerful there. Since planets in the cadent houses are declining away from the angles, their power is seen as weakened or waning.